If you have noticed a sudden increase in the number of hairs on your pillow in the morning or the amount of hair in the shower drain, you might need hair loss treatment in New Bedford. 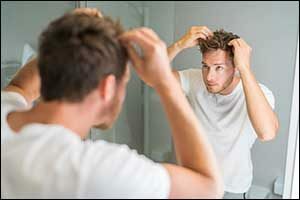 Male pattern baldness is the number one type of Southeastern Massachusetts hair loss that we see in men. While some types of hair loss can be reversed and the client can regrow hair in the Greater Boston area, others require specialized treatment. South Coast Hair Options treats each client as an individual. 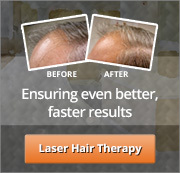 We target your specific type of hair loss according to your lifestyle and your budget. Whether you would benefit from low-level laser hair therapy or dermal lens hair treatments can depend on a wide variety of factors. The first thing you should do is schedule a consultation appointment with our team right away. Don’t wait when it comes to hair loss. The sooner we can get started to find a treatment that works for your unique situation, the easier it will be to regrow hair in the Greater Boston area. Many people just wait too long, whether it is because they are embarrassed or they might think that there’s nothing that can be done to stop hair loss. What they don’t understand is that Southeastern Massachusetts hair loss is common among both men and women. There is a hair loss treatment in New Bedford for every type of hair loss, regardless of the extent. However, it is important to note that just because you are noticing a lot of hairs on your pillow or shower drain, this does not mean that you have male pattern baldness. This is why it is essential to get a custom scalp assessment. South Coast Hair Options offers this as a free service to our new clients to help us evaluate your unique situation and determine what needs to be done to help you have that thick, full head of hair that you desire. Hair loss is gradual over time, but many men don’t notice it until they already have a bald spot somewhere on their scalp. If you are losing a lot of hair at a rapid rate, you should speak with a physician to determine if there is an underlying health condition that should also be treated along with the hair loss. The average person loses between 50-100 hairs a day. That may sound like a lot, but it is part of your body’s natural growth cycle. Cyclic hair loss has happened since you were born. Permanent hair loss is a different matter entirely, which is why it is key to diagnose the difference. If you have noticed that your hairline is receding or see a bare patch on the top of your head, it could be a sign of permanent hair loss. Our team begins every new relationship by performing a scalp evaluation. This helps us to start a baseline for identifying the type of hair loss that you are experiencing, where you need help the most, and collect other relative information. One of the things that you need to understand is that once hair starts to recede, it does not grow back naturally on its own. You will need to slow the process to stop it from progressing and use additional methods to restore and regrow hair in the Greater Boston area. Some types of hair loss can be reversed through treatment, while other types may require dermal lens hair or other professional solutions to get you the look, thickness, and hairstyle that you desire. Hair transplants are an option, but there are also pain-free and surgical-free solutions that can be used as well. Our team will work with you to find a solution that is based on your specific needs, desires, and budget. Our approach to hair loss treatment in New Bedford is different from anything else that you have seen at other clinics and treatment centers. If you have been suffering from Southeastern Massachusetts hair loss, come by our clinic for a free, comprehensive evaluation. Our Corrective Hair Solutions (CHS) approach is safe and natural, affordable for any budget, and designed to support your active lifestyle. Each treatment program is tailored specifically to your needs to work with your existing hair, matching color, type, length, curl and growth patterns. We can solve ALL of your hair loss problems and help you to look your best without anyone knowing that you received treatment at our South Coast hair clinic. Schedule an appointment by calling 508-995-7085 or speak with one of our representatives about any questions or concerns that you might have. We can provide you with all of the answers you need to make an informed decision. However, we can’t tell you if we will be able to regrow hair in the Greater Boston area or if you might need an alternative solution for hair loss treatment in New Bedford until we perform a scalp evaluation and consultation. Call today to get started!